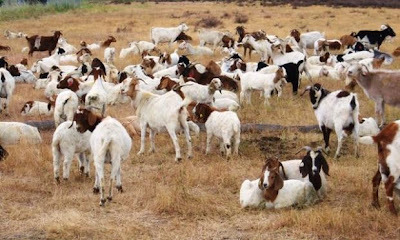 In an effort to encourage "a more carbon-friendly, less polluting alternative to lawn mowers", Google has turned to employing goats to chew down the excessive vegetation on its sprawling California campus. Well anyway, I think it's a pretty neat story. Having grown up on a farm with a number of goats I can attest that they can eat anything, and will faithfully keep the grass and weeds at bay. Who knows: maybe with some good PR, goats and sheep can become the next "cool" pets to own. "(And as an added bonus, they can provide goats milk and lambchops!)" Silly city boy! Lambs are not baby goats, they are baby sheep. Baby goats are called kids, and make yummy BBQ and tacos, but very poor "chops".